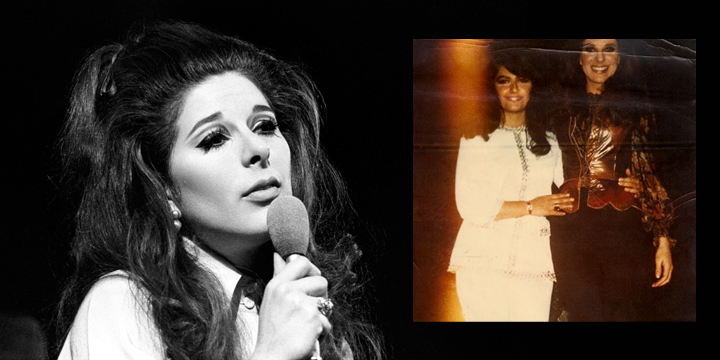 I wrote to Bobbie Gentry in the late 60s at the height of the fame of ‘Ode to Billie Joe’, and I was amazed when she replied in person! Sometime later when she came to London to record her her own TV series on BBC2, I decided to go and see her. When I arrived the audience was already settled and I was turned down at Reception because no further seats were available; but I didn’t give up! I spoke to someone from Production, they spoke to Bobbie and I was shown inside, a special chair was brought for me to sit in right at the front!! When Bobbie appeared she was like a light in darkness, she was a goddess: Beautiful, friendly, and with no airs & graces. She walked right up to me, and bent down to chat to me as if to an old friend, she thanked me for coming and said we would chat after the show, and take some photos. Everyone looked at me with envy!! And true to her word, we met afterwards, and she also introduced me to Jerry Reed her guest that night. We took some photos and she also signed the portrait of her which I had painted. I was very touched by her behaviour; I was just a fan, yet she treated me as a VIP and that says everything you need to know about her character.